Kit to repair one 11 inch speaker. Comes with 1 surround, instructions, speaker adhesive, applicator brush, and phone or email technical support. Fits a speaker cone of 8 1/2" Works on angle attach speaker cones. 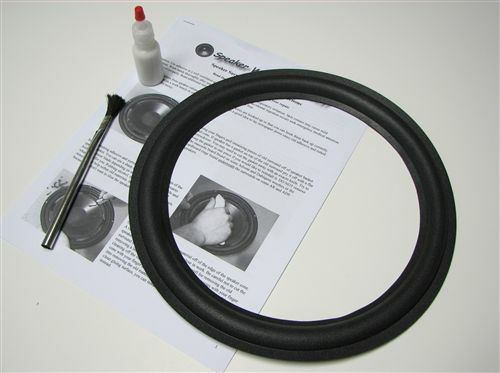 Speaker repair kits are also reffered to as speaker refoam kits, foam edge kits, or reedge kits. AR, Acoustic Research, AR-3, AR3, AR-3a, AR3a, AR-9, AR9, AR-10 pi, AR10pi, AR-10, AR10, AR-11, AR11, AR58, AR-58, AR58B, 58BX, 58BXI, 58S, 58SU, 58LS, AR-91, AR91, 915, 1210003-2, 1210003, 1210079, 12200003, 1210079-0, 200003, 78LS, AR-98LS, AR98LS, AR-9LS, AR9LS, 9LSI, AR-LST, LST, TSW-610, TSW610, TSW-910, TSW910, 50T, and other speakers. Surround Outside Diameter: 10 1/2"
Speaker Cone Outside Diameter: 8 1/2"
Surround Inside Diameter: 8 1/8"
Exactly what was required and delivery was as stated. Reviewer: leonard verwoerd from Abbotdford, B.C. Received recommended foam surround, installed it according to included directions. Not a difficult project. Good quality surround with very easy follow instructions. Just about anyone can renew a speaker with this kit. With complete instruction and parts made this a very easy repair. Only had to wait for the glue to dry.